I used to think that Mardi Gras was a big deal in Germany. I still do. It just may be a bigger deal here on the Gulf Coast. In the three weeks this year leading up to and including today’s "Fat Tuesday" (the Tuesday right before Ash Wednesday) there were no less than 30 Mardi Gras parades through downtown Mobile. Some days there is more than one parade. Police estimated the crowds today to be around 100,000 people, about half of last year’s total. (Last year a number of visitors came to Mobile instead of going to New Orleans.) The big finale here is Fat Tuesday instead of "Rosenmontag". 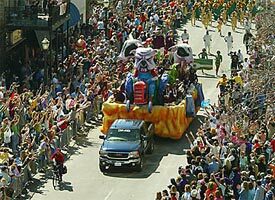 One big difference between Mardi Gras in Mobile and in Germany is that the weather here is generally better, with temperatures usually at least around 60 degrees Fahrenheit (15 C) during the daytime parades. After having downtown blocked off in recent days during the parades, things will return to normal tomorrow until next year’s crazy days.